The Banks Fire District responded Friday morning to a crash that left the vehicle's driver trapped. One person was medically evacuated by air ambulance after a rollover crash in northwestern Washington County on Friday morning, Dec. 14. The driver of the vehicle that rolled over on Timber Road, south of Highway 26, was pinned and had to be extricated by emergency crews. The Banks Fire District and Tualatin Valley Fire & Rescue were among the agencies that responded to the crash. Banks Fire District spokesman Mitch Ward said the LifeFlight Network was activated to respond to the single-vehicle crash on Friday. Timber Junction was used as the staging area. MetroWest Ambulance transported the injured motorist from the crash scene to the LifeFlight landing zone, according to another Banks Fire spokesman, Scott Adams. The seriousness of the driver's condition was not immediately clear. 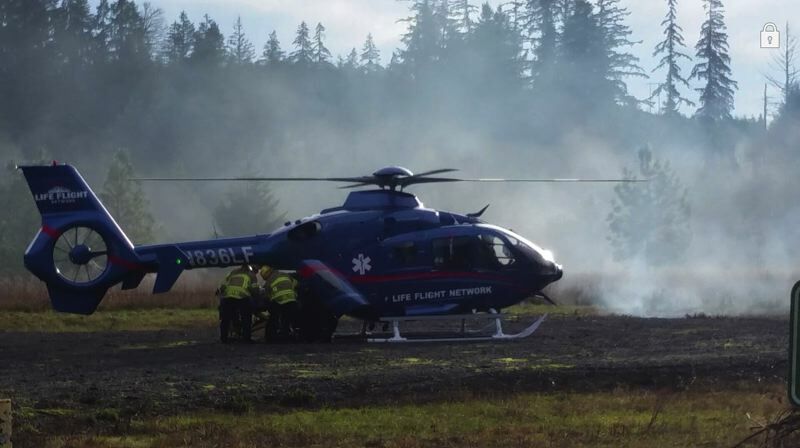 The air ambulance service LifeFlight frequently responds to incidents in rural Washington County, due in part to the driving distance between areas like Timber and certified trauma centers in Portland. Editor's note: This story has been updated with more information from the Banks Fire District.